Wood Talk No. 107 is hot and ready for your ears my friends! It was just posted only hours after being recorded, because we know how much you like your woodworking talk shows fresh out of the oven. Again, as part of our recent format change to recording every week we’re also posting the file and downloads at one location from this point out. 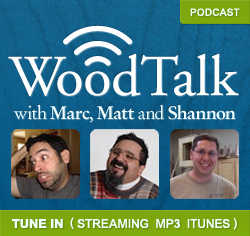 To find the shownotes with all the links to topics being discussed today, along with previous episodes, visit the show page at www.WoodTalkShow.com. You can find Wood Talk No. 107 by following CLICKING HERE! and don’t forget to visit Wood Talk’s sponsor for this month MicroJig at www.microjig.com.